Instead of over-using your hand and wrist, your arm will most of the time let the optical Handshoe Mouse float without any effort. 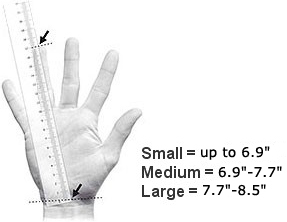 The shape allows for the hand to continuously rest on the mouse body in a relaxed fashion, so there is no skin contact between your hand and the desk. As a result there is no skin irritation as caused by excessive rubbing when moving a conventional mouse. 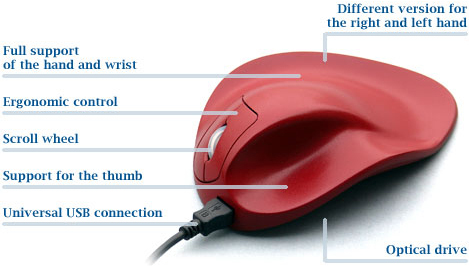 Contrary to conventional computer mice you don't have to continuously lift (hover) the fingers, to prevent accidental switching. The user friendly HandShoe Mouse is an ergonomic mouse available in 3 standard sizes for the right hand: small, medium and large. On special request left hand versions and extra small versions for the right and left hand can also be produced. The large size HandShoe Mouse has a third switch button. This switch button is not programmable; it has the same function as the click function underneath the scroll wheel.